One company’s trash is another company’s resource. When it comes to industrial waste, the numbers are shocking. The EPA has estimated that companies in the U.S. spend an estimated $22 billion per year to send 214 million tons of materials to landfills. While some of that waste can be diverted to recycling programs, the more striking fact is the waste that ends up in landfills often still has tangible value. In some cases, a company is paying to haul one material to the dump, while another company is spending top dollar to purchase the very same material new. Companies are literally throwing money away, and destroying natural resources in the process. After reading the Tom Friedman book The World Is Flat, Brooke Betts Farrell became passionate about intervening in the industrial waste crisis. She began talking to her brother-in-law Chad Farrell, who had built B2B marketplaces online, about how to build a business model around consumerizing corporate waste streams. “We saw an invitation, on both sides of the market, to turn what they think is waste into a resource,” says Brooke. They founded the company RecycleMatch as an online go-between for industrial trash, matching businesses creating waste streams with businesses who wanted to reuse materials. Brooke and Chad believed their idea would work based on stories they had heard about two big companies: IBM and Ford. 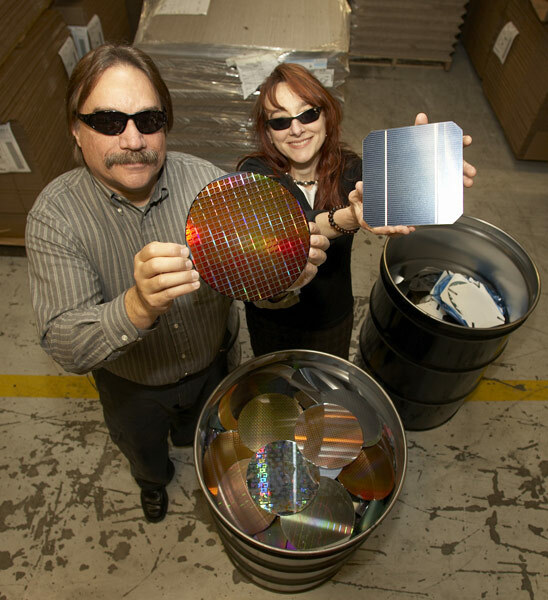 In 2007 IBM found a way to sell the silicon wafers used to build computer chips to the solar industry, saving the company $1.5 million in one year. And Ford had partnered with farmers in Ontario to use their wheat straw waste, which the auto company could process into a plastic used for the storage bins inside cars. These stories were helpful in demonstrating to Brooke and Chad that companies, especially large ones, would be actively looking for alternatives to the landfill. 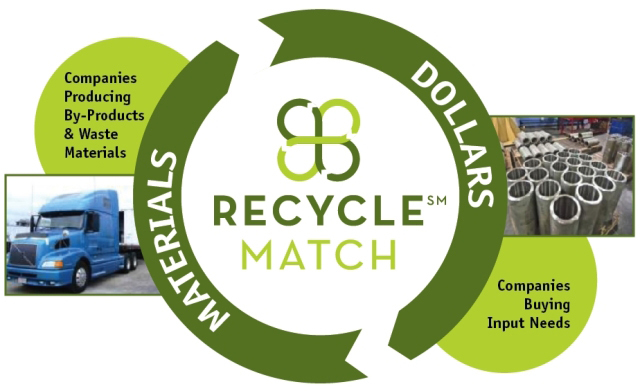 RecycleMatch is not simply a free-for-all Internet bulletin board — each client is carefully considered and only listed if its waste stream has value. Listing a material on the site is free, says Brooke, but when a match is made, businesses pay a one-time $1500 matching fee to RecycleMatch as well as $10 per ton. The one-time matching fee is high enough to prevent consumers from listing, say, their living room furniture (Brooke says you’d be surprised how many people want to), and the per-ton rate is far below the cost of what companies usually pay to haul industrial waste — it can range from $44 to over $100 per ton for non-hazardous waste to go into a landfill. Clients can browse by materials, from concrete to textiles (there’s also a section for food waste, which Brooke says often goes to zoos). Material samples often change hands and prototyping is done to see if the reused material will work. Some exchanges require environmental audits as well. The clients are then kept confidential until the match is a sure thing, but they are then introduced to each other to facilitate the transaction. In the year since RecycleMatch has been live, they’ve already made dozens of incredible matches — a series of case studies (with the client names removed) tell extremely engaging success stories. Brooke likes to use the example of a large construction company which found itself with a surfeit of broken windows in a building after a hurricane. The company needed to maintain a zero-waste policy to retain its LEED status for the project, but their glass recyclers wouldn’t take the windows. RecycleMatch was able to match them with a surfaces manufacturer, who was able to grind the windows into countertops. With very little outreach and no money spent on advertising, RecycleMatch has already gained attention from awards shows and venture capitalists. Yesterday, Brooke was named as a PopTech Fellow, where RecycleMatch will be incubated in the same social-change program as other global startups and nonprofits. If you have a design and sustainability story to share, let us know about it! Check out the Designers Accord Web site and follow us on Twitter @designersaccord to hear what the Designers Accord community is thinking about.